It’s Snapchat’s best new feature this year. Snapchat, a potentially dying social media platform beloved of teens, has finally introduced a feature its competitors can’t rip off: it’s an animated, dancing hot dog. The cheeky sausage, dressed in headphones and a bun, is an instant hit on the internet, with people putting it into every position you can think of. If you’ve yet to encounter him yet on your Snaps, here’s a compilation that sums him up best, from Roy Purdy. People are playing with the hot dog like it’s a meme, but its sheer popularity and its corporate origins make it feel more like an old media product. The hot dog is reminiscent of Spongebob Squarepants, a mass-market cartoon character who has taken on a pile of completely separate identities as a meme. Whatever it was originally supposed to be, the internet has its own ideas. But no one can decide: is the hot dog akin to a god, like Harambe the gorilla? Or is it a piece of annoying trash? Either way, its phallic shape and variety of animated tricks ensure that it fits into just about any meme paradigm you can think of. JERY: so how was your date with the snapchat hot dog? There’s even a Chrome extension called Hotdog Hell, which replaces all images on Facebook with the hot dog. The results are, unsurprisingly, pretty funny. Because Snapchat is a huge part of internet culture, the hot dog is a universal reference for teens and millennials. It’s highly recognizable, and it’s everywhere. The ubiquity of the hot dog has led meme elitists to declare it “dead” already—due to appearances on derivative sites like 9gag and iFunny. “So very sad to say that snapchat hot dog has gone normie SELL SELL SELL! !,” wrote one poster on Reddit’s r/memeconomy, a forum where people “buy” and “sell” memes, debating which are interesting and which are passé. But the hot dog never really had a chance with the snobbiest part of the “dank meme” crowd. It’s a top-down meme, a default filter on a popular chat app, not some grassroots movement like “dicks out for Harambe” or the Gay Babadook. 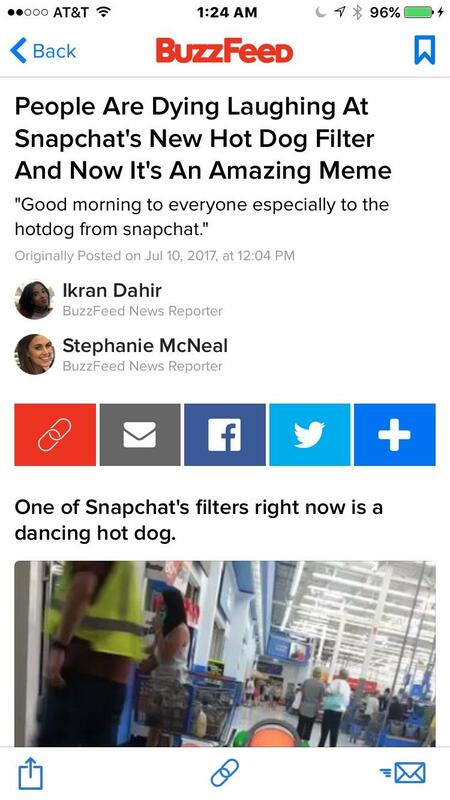 “The hotdog meme was normie from the start, I mean, the supplier was Snapchat,” wrote one r/memeconomy commenter. That doesn’t mean the meme-loving public has no say in how the hot dog evolves, though. Pepe the Frog was just a chill webcomic character before he became a 4chan mascot and then a Nazi—once he was on the internet, even his creator couldn’t stop that train. What does the Snapchat hot dog really “mean”? Anything. Nothing. Whatever we want it to.